1 Line a 20 x 30cm tin with baking parchment. Place the fresh raspberries in a pan with the icing sugar and 3 tbsp cold water and bring to a simmer until the raspberries are soft and pulpy. Sieve into a small heatproof bowl and discard the pips, then stir in the rose water and keep warm. 2 Heat the sugar and golden syrup in a small pan with 150ml cold water to soft-ball (120°C on a sugar thermometer, about 10 minutes). 3 Place the bowl of raspberry purée over a pan of simmering water. Sprinkle over the gelatine and heat until dissolved completely. 4 When the sugar syrup has reached the correct temperature, remove from the heat and whisk in the gelatine raspberry mixture, taking care as it will bubble and spit. 5 In a separate large bowl, whisk the egg whites with an electric handheld whisk until they form soft peaks. Slowly add the hot raspberry mixture and vanilla, whisking continuously, until glossy and thick — this can take about 5 minutes until tripled in size. 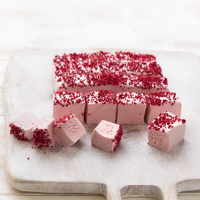 6 Pour into the prepared tin, scatter over the dried raspberries and leave to set. Cut into squares using a wet or oiled knife. This recipe was first published in Wed Feb 26 11:16:00 GMT 2014.